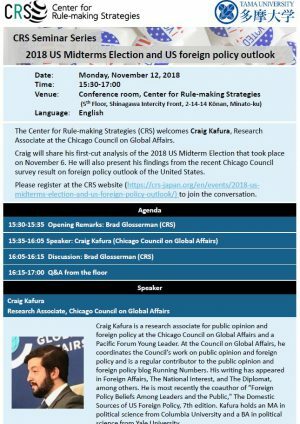 The Center for Rule-making Strategies (CRS) welcomes Craig Kafura, Research Associate at the Chicago Council on Global Affairs. Craig will share his first-cut analysis of the 2018 US Midterm Election that took place on November 6. He will also present his findings from the recent Chicago Council survey result on foreign policy outlook of the United States.